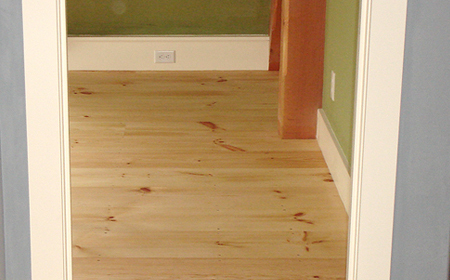 We recommend that the pine flooring acclimate to inside your house for 7 to 10 days minimum prior to any installation. It is important to take the time and plan the layout of your wood floor. You do not want to have the last few boards responsible for all the differences of an odd shaped room. If you take the time to plan, you can easily hide any differences around the edges or under a counter, so that it is not immediately noticeable when you first walk in the room. Remember, the floor must be able to expand in all directions without any pressure. Maintain a 3/4" gap around the edge of the room. Never "zero-fit" the floorboards to the room. Select several straight boards for the first and last few rows. Some boards are naturally more crooked than others, and you can pull them into place easily when working in the middle of the room. If at all possible, you should lay the floor perpendicular to the joists. 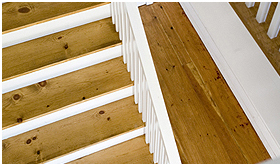 You will need an especially strong subfloor if you lay them parallel to the joists. 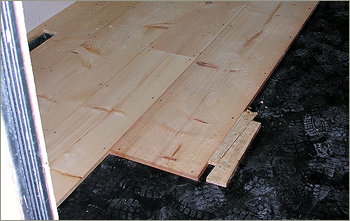 Stagger flooring during installation so that the end joints are at least 4" to 6", or farther, apart in any direction. © 2006 - 2019. South County Post and Beam, Inc.